I just got a new camera and decided that a short Roadtrip would be just the way to check it out. It's a Canon EOS 5D Mk III and moves my Canon EOS 40D to backup status. I've wanted to check out US 191, formerly US 666, for some time. I thought this would be a good time to check it out. 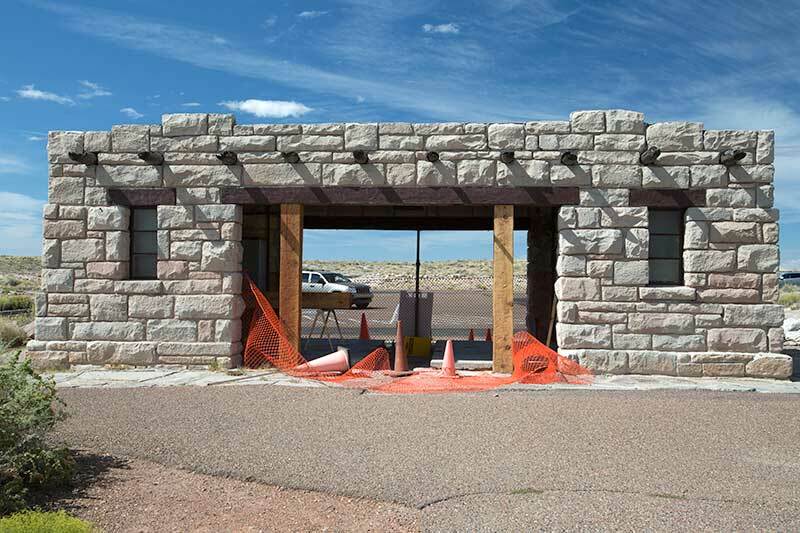 There is a very long story about how US Route 666 came to be that can be found here on the FHA website. Long story short - Many did not like the association of the number 666 as the "number of the beast - the Devil. The highway was nicknamed the Devil's Highway. 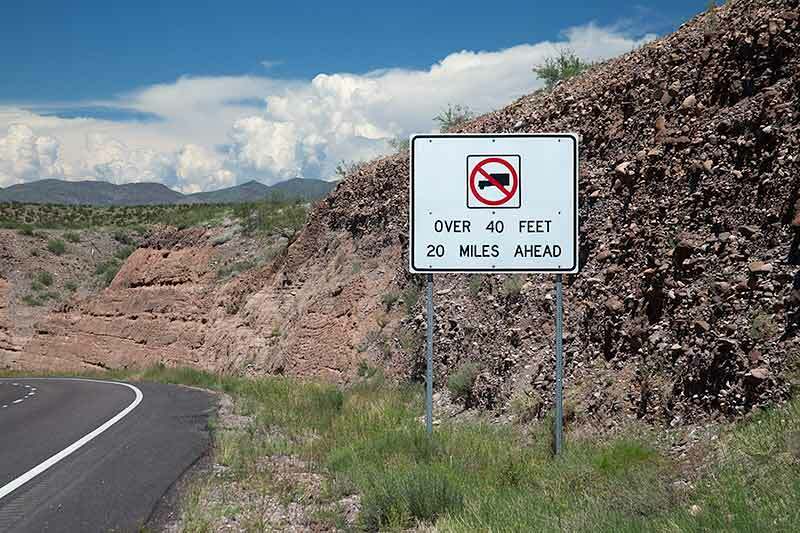 In many ways, that stretch of the highway that runs between Clifton AZ and Alpine AZ has features of a "Devil's Highway." There are few straight stretches and few places without great elevation changes. 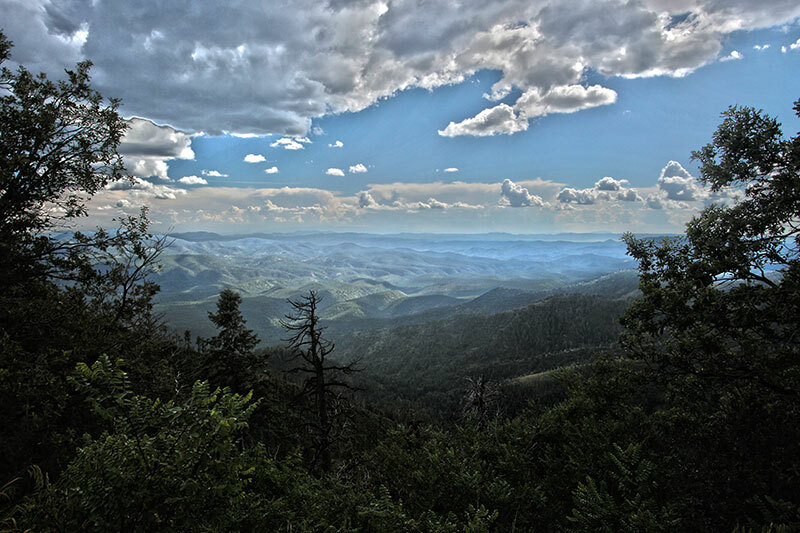 It runs on the backbone of the White Mountains just west of the AZ/NM border. 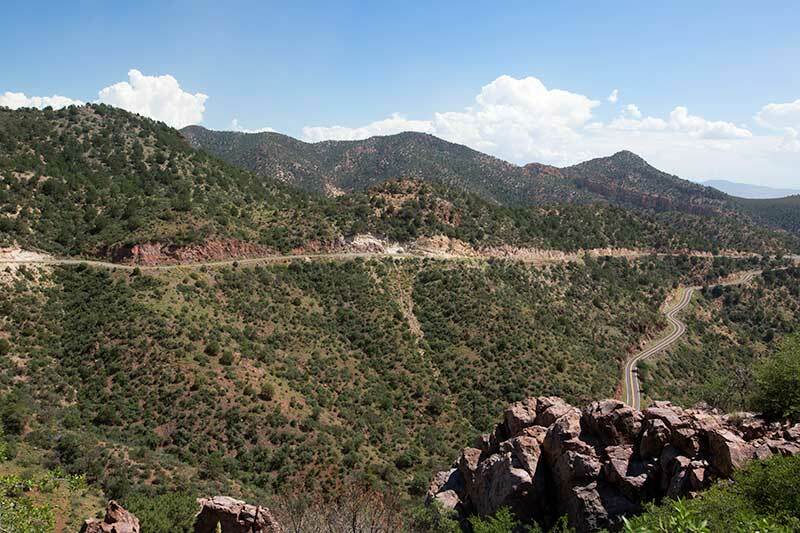 From Clifton AZ you start at an elevation of 700' and in the next thirty miles, climb to an elevation of almost 9000'. The route levels and straightens somewhat for the next 30 miles before dropping to 7000' at Springerville. Once you leave Clifton at the southern end, there are no services for the next 90 miles. I left the Phoenix Valley to temperatures of 105. Along this route I ran into snow along the side of the road in the higher elevations and rain near the end. Now named US 191, this stretch of the route is indeed, the Devil's Highway. Forgotten and abandoned, but not gone. Found in Superior AZ. It seems like every small town has several of these. What used to be thriving little towns are in decline as the younger generations move to more urban and promising environments. Helping (Causing?) that decline are the new highways and interstates that bypass these communities in the name of "Progress". It used to be that 300 miles was the reasonable limit to what you could travel by car in a day. So these little towns served that traffic by providing convenient lodging, fuel, auto repairs and restaurants. This photo has been manipulated and stylized by Photoshop HDR. More on that later. 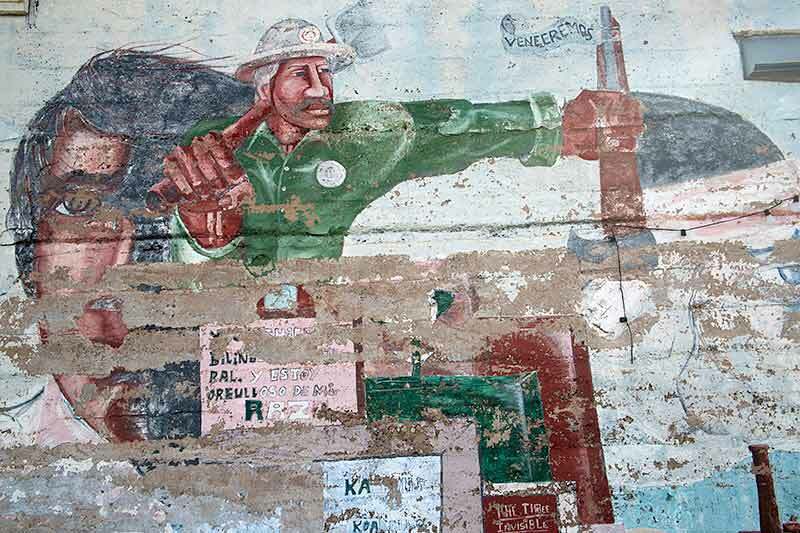 Apparently, when Superior was a thriving "Metropolis" and civic pride ran high, many of the businesses had murals depicting local activities painted on the side of their buildings. 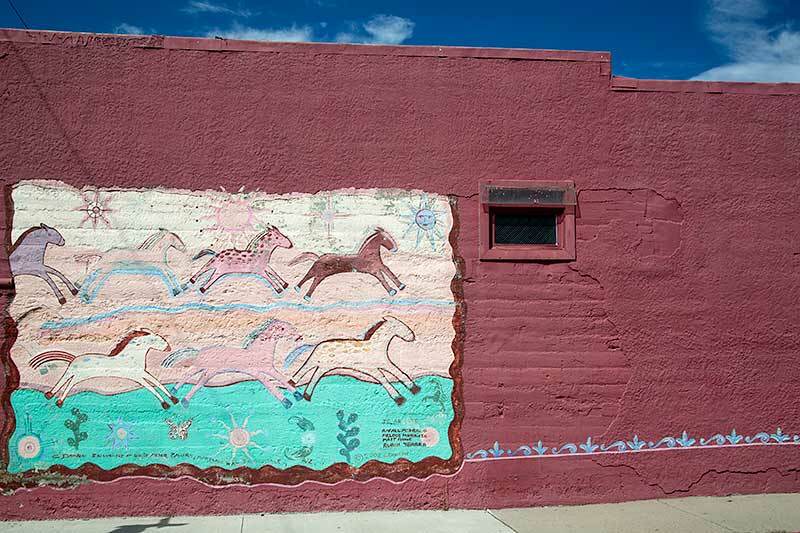 This is one such mural. It has seen better days and the business is closed. Here's another. This business is a cafe and is open. Looks like they have recently refurbished the mural. 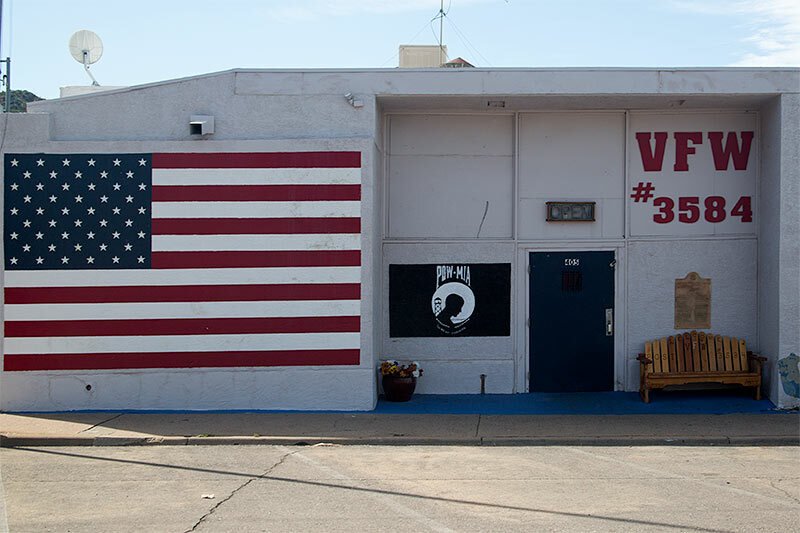 And here's the Superior VFW - Patriotically open for business . . . ! So you leave Superior, make you way through Globe where you pick up US70 and make your way to Safford and Solomon where you pick up US191 (666) North. There you'll see this sign. This is likely to be a great ride! Shortly thereafter you find Clifton where you better fuel up, check your oil and stock up on snacks and drinks, as you'll have another 90 miles before you find any more services. You'll climb a couple steep switch-backs, pass the cut-off for Morenci and this is what you see. 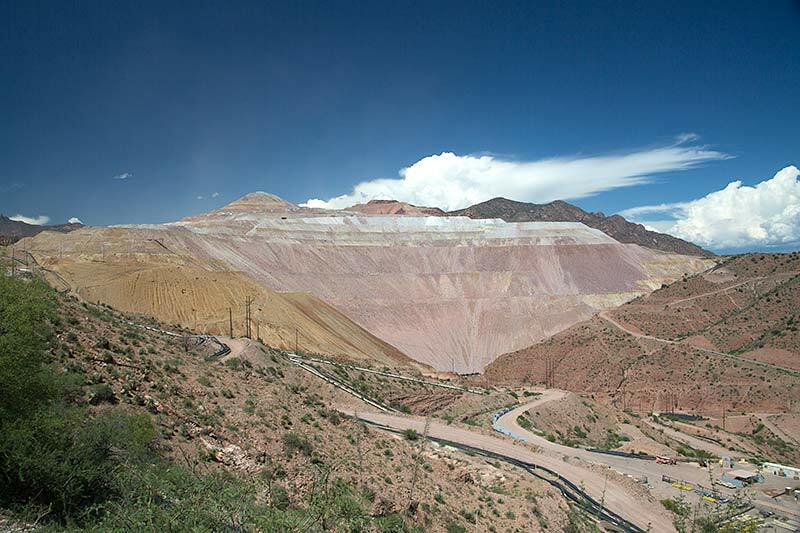 This is the face of the Morenci Mine, behind which is miles of open-pit copper mining. 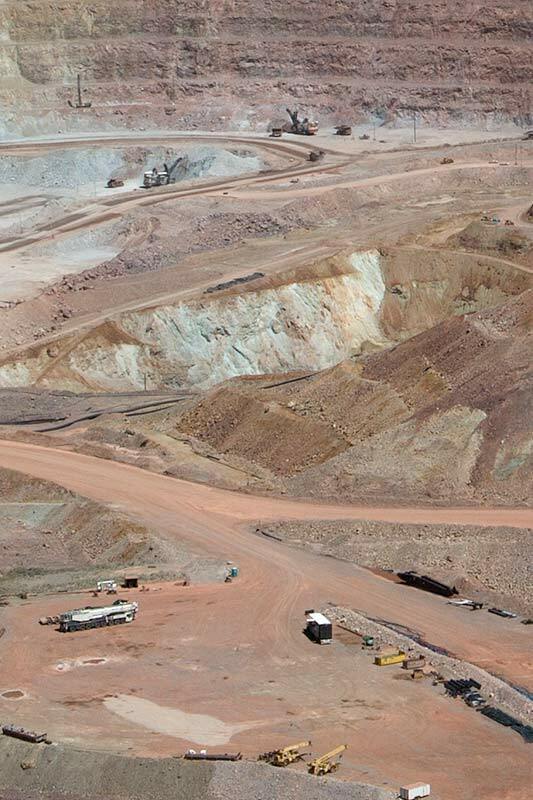 This is the largest Copper mine in the US and the second in the world, behind a copper mine in Chile. It's owned by Freeport-McMoRan who employs 2000 people at this site. Morenci is a company town and all the housing is owned by the Morenci Mine. Almost everyone who lives in Clifton and Morenci is employed at the mine. 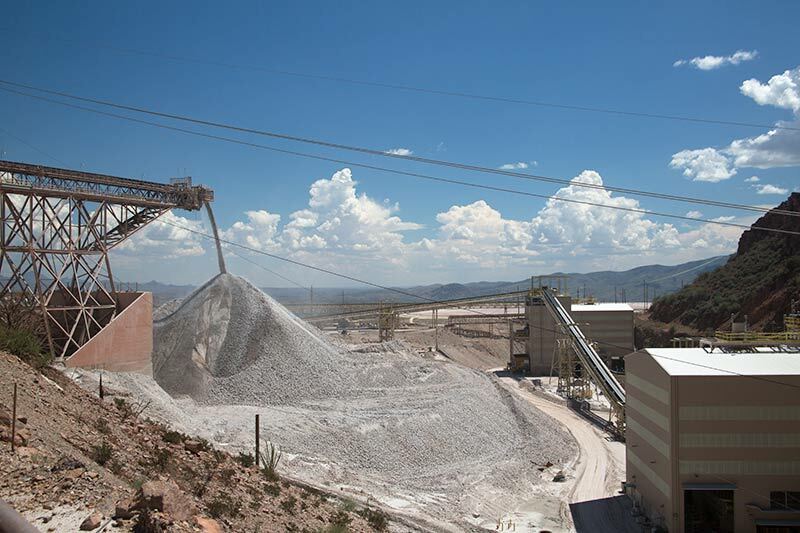 The Morenci Open Pit Copper Mine operates non-stop, processes 700,000 tons of rock a day, and produces about 840 million pounds of copper a year. You can find more information on the Morenci Mine and copper mining in general by doing an internet search on the term Morenci Mine. Make you way through another couple switch-backs and you pass UNDER this conveyer spewing rock into a pile. This is a huge operation and dominates the area. Who would have thought that wandering through all this industrialization, you'd find some wildlife. 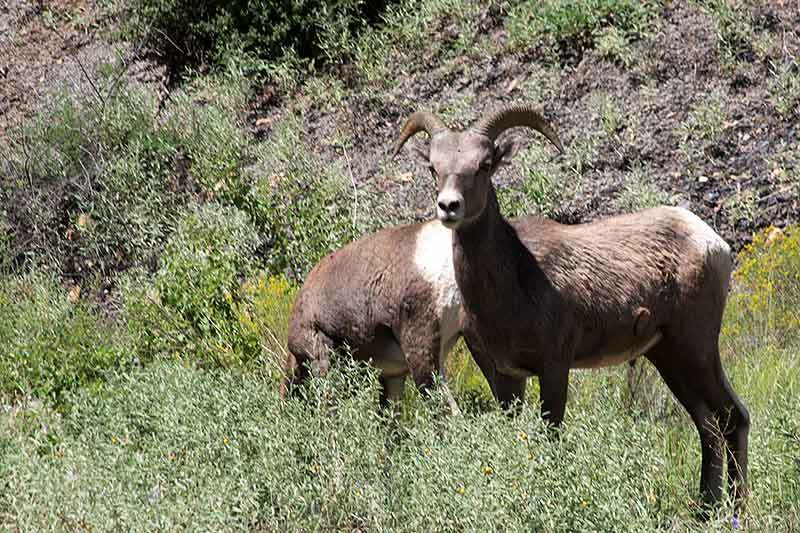 These are Rocky Mountain Bighorn Sheep. I drove through a small herd of a half-dozen or so. Apparently they are habituated to the industry and to people. In my research, I found that they are sometimes found in Morenci and Clifton foraging on residential gardens. Tree hugger's heads would spin in total denial. 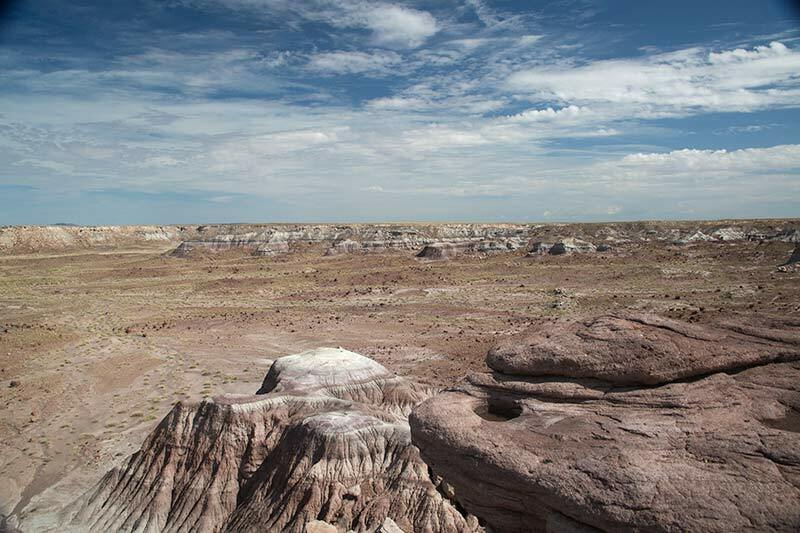 This is a composite panorama of 4 photos taken from an overlook on US191. At this point, the pit appears to be over a mile wide and over a mile long. The next photo should give you some perspective. This is an enlargement of the area just at the center of the panorama. At the top of this photo you can see some shovels operating and filling trucks around them. The tires on those trucks are almost 8 feet in diameter. 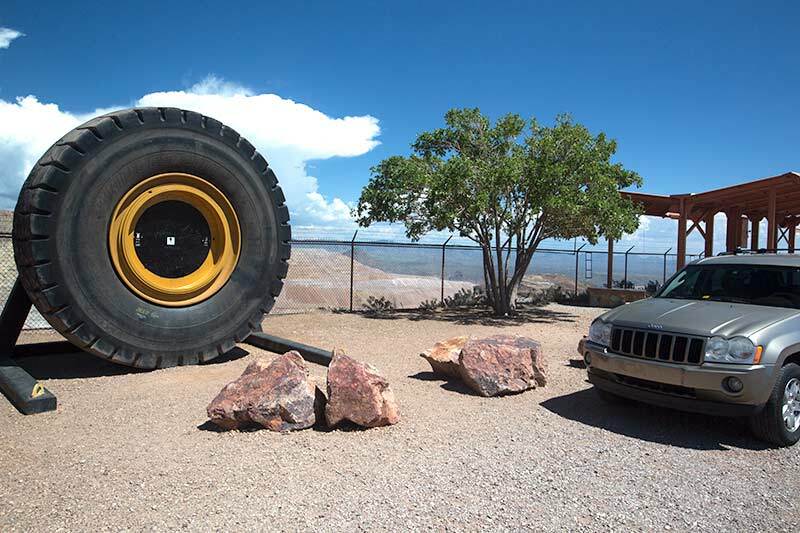 Here's one of the tires at the overlook. 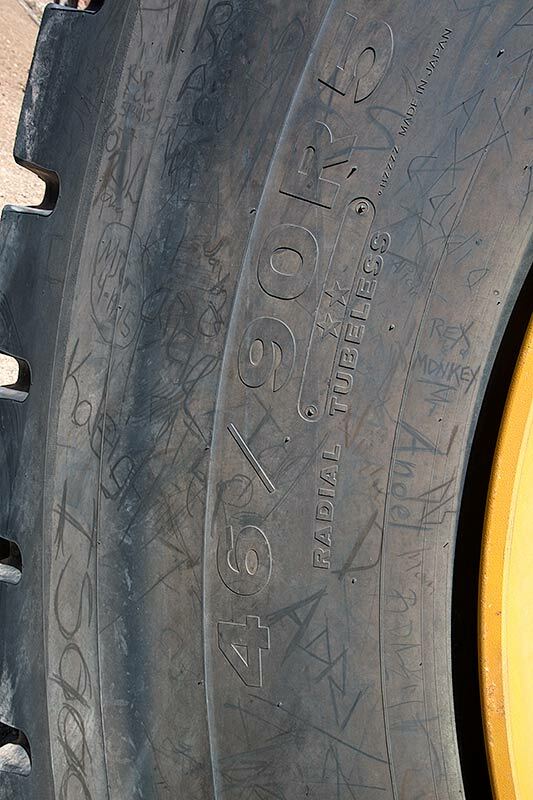 And here's the size of the tire - if you can make it out through the graffiti - it's 46" wide and 90" in diameter. It's a tubeless radial no less..! This is a view of the road I've just traveled from the mine. This vantage point is two switch-backs from what you see. After climbing for 30 miles or so, it's overcast and spitting rain. I've already seen snow on the side of the road. This is a "Vista" along the way. This is an HDR photo. That is, High Dynamic Range. This one is a composite of three photos, one shot at the proper exposure, one overexposed at 1 stop and one underexposed at 1 stop. The photos are combined using the properly exposed parts of each. The underexposed image will have the highlights properly exposed, the overexposed image will have the darks properly exposed and the middle image will have the mid-ranges properly exposed. In theory. In reality you have a lot of control how the images are merged. This one is a bit stylized, like the first image on this page and the "edges" of the images are enhanced somewhat and some are softened. In this way you can see things in a photographic image you would not ordinarily be able to see - like the mountain peaks and ranges in the mid-range and detail in the foreground. Hope that helps!! On the way between Morenci and here, I did see a small brown bear. I know. There are only black bears in AZ. I'm just telling you what color this one was. Unusual to see one but they are in this area. I didn't get a photo of it because there was a car coming the other way that almost hit it. In my hurry to stop the car and grab my camera, he scurried off up the hill, out of sight. I had the wrong lens on the camera anyhow. 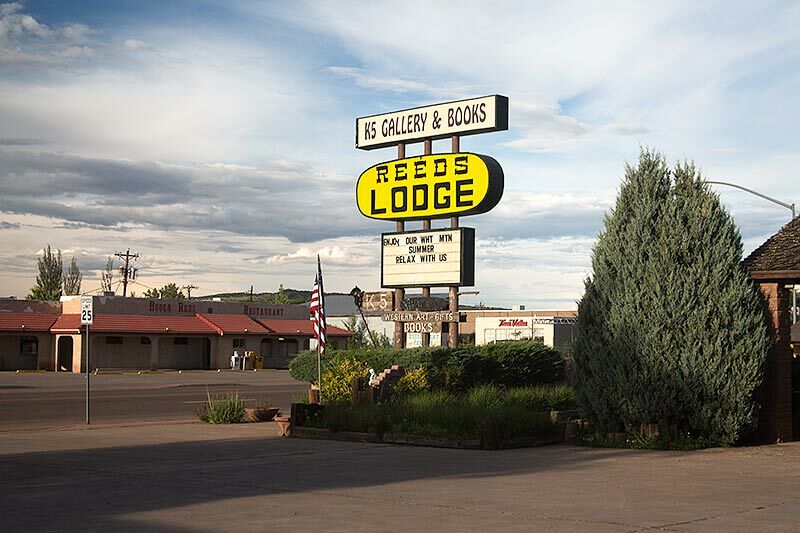 The next stop and the stay for the night, was Springerville. I stayed here - I sacrificed so you don't have to. Don't stay here. Please. I generally try to stay at local motels and lodges as they are generally pretty good and also inexpensive. Inexpensive in this case, but not good. The reviews I found on-line were generally pretty good. Bunch of idiots I'd say. Again, do yourself a favor and don't stay here. There are a half-dozen other places nearby. So after a night in a noisy motel in Springerville on a crappy king-size mattress, I headed north to Holbrook AZ. 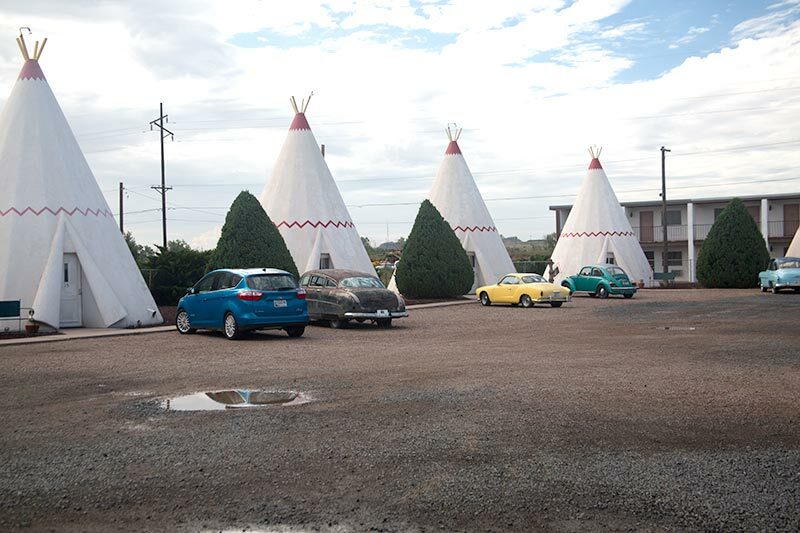 After fueling up I stopped at the Wigwam Motel, a Route 66 Icon. 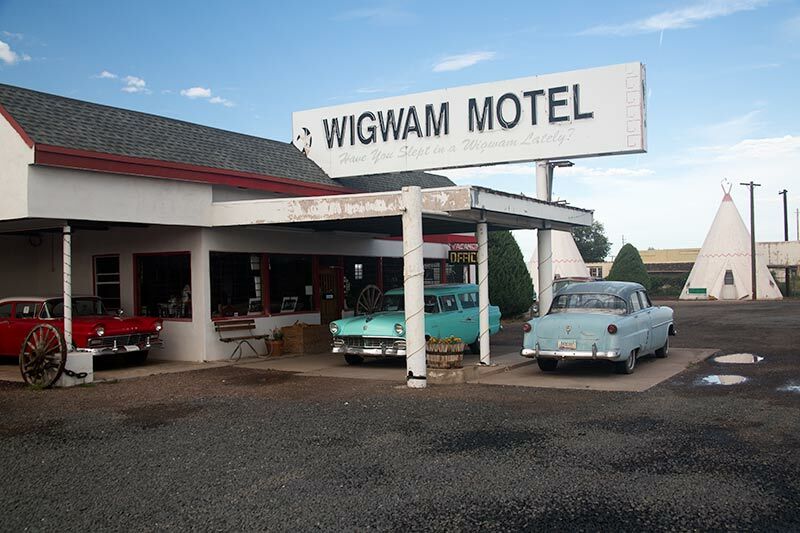 Had you traveled Route 66 in its prime, you'd have given your left arm to have stayed at the Wigwam. I've been past several times in the past 15 years and figured one time I'd give it a shot and spend a night. Well, maybe. The motel consists of the office, closed when I stopped at 9 am, and a dozen concrete Wigwams which serve as rooms. Parked all around are vintage cars from the Route 66 era. Some even have current tags on them. 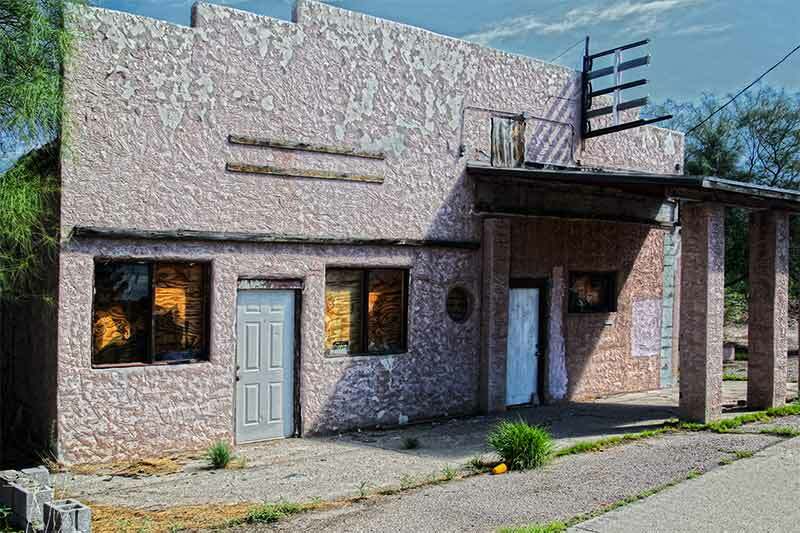 In any case, it looks to me like the place is falling into disrepair, just like everthing else in Holbrook. All the paint needs scraping and refreshing, cracks need repair and the vintage cars are in need of a LOT of care. If the outside is like that, what does the inside of the rooms look like? Here's a photo of some of the "Wigwam" rooms. Any new car you see is a visitor staying in one of the rooms. All the vintage cars are props. 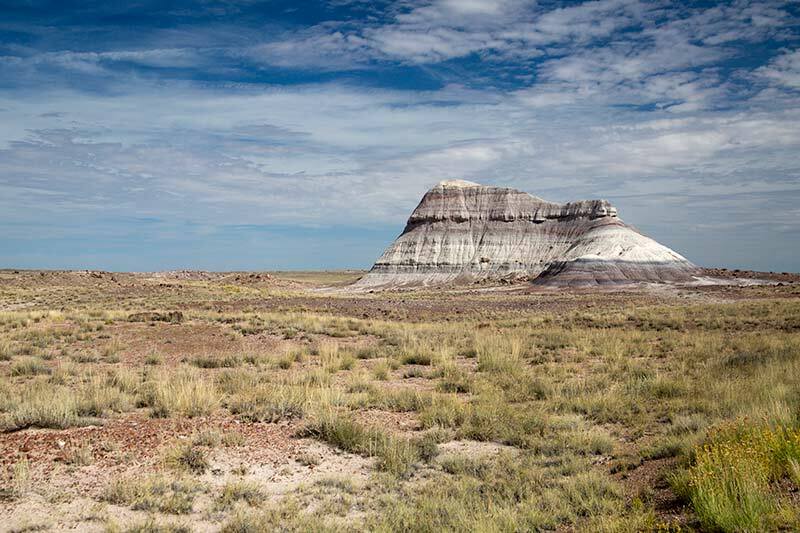 So after Holbrook I back-tracked about 20 miles to the entrance of the Petrified Forest/Painted Desert National Parks. Don't be fooled. At the entrance road off US 180 it looks like there are National Park museums and retail outlets on either side of the intersection. They are not. They are private retail stores selling petrified log products from their private land and geodes from who knows where - at pretty exhorbitant prices too. Stop and look. Leave your wallet in the car. 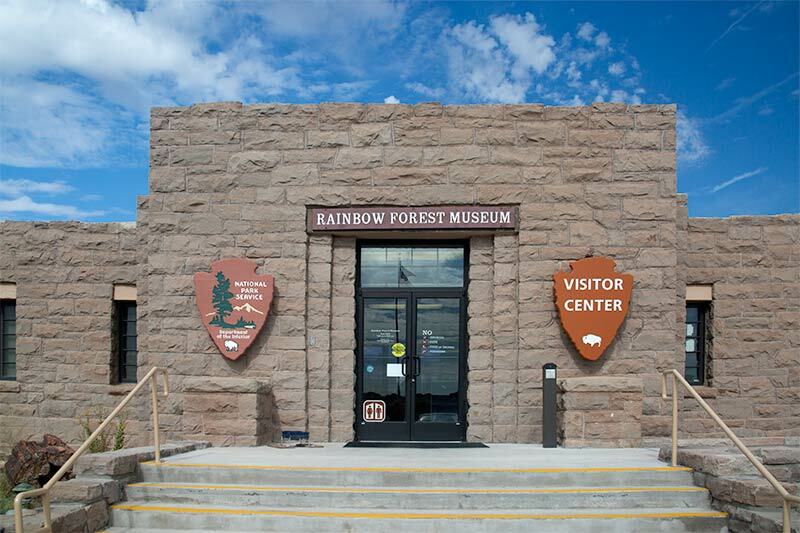 The real entrance to the National Parks is a half-mile further and the Visitor Center, above, is a half-mile further than that. There is a nice Interpretive Trail behind the Visitor Center. Pick up a guide and walk the trail. 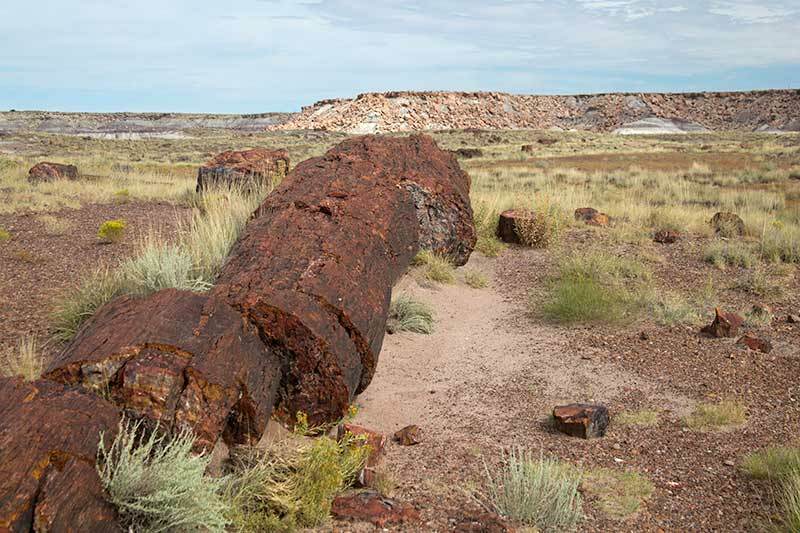 It explains a lot about the Petrified Logs found in this area. 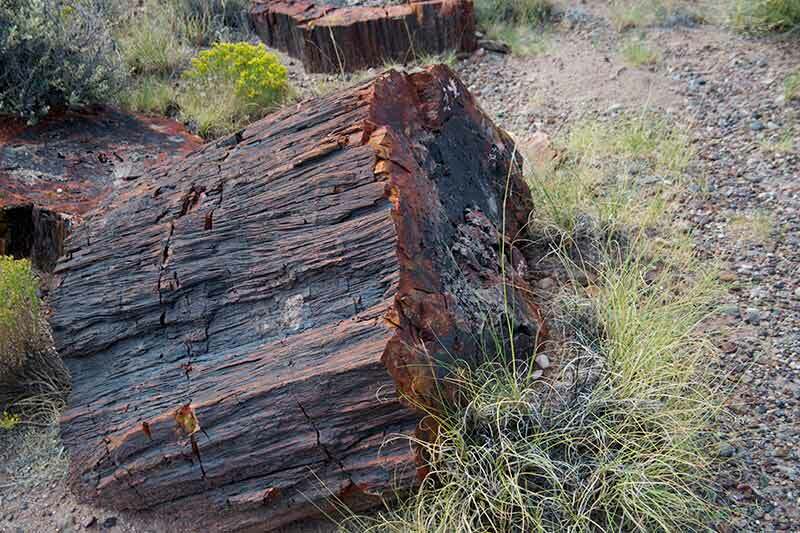 Basically, the body of an ancient log has been replaced with minerals from the soil over the eons. In raw form, I'm not too impressed - rather drab. But, cut and polished, as you find in some of the retail (rip-off) stores in the area, they can be quite attractive. Just not the sort of thing I'd decorate my house with. Another stone log. Rather amazing really. 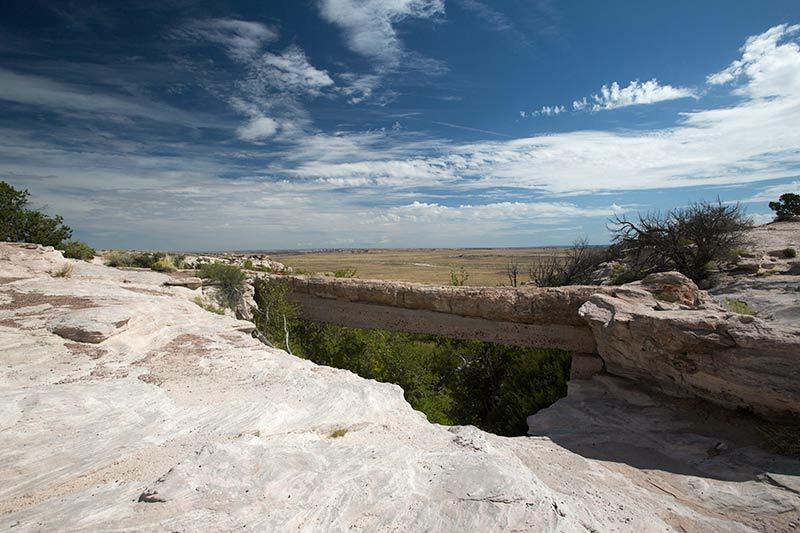 But what I find more interesting is the landscape of these co-joined National Parks. 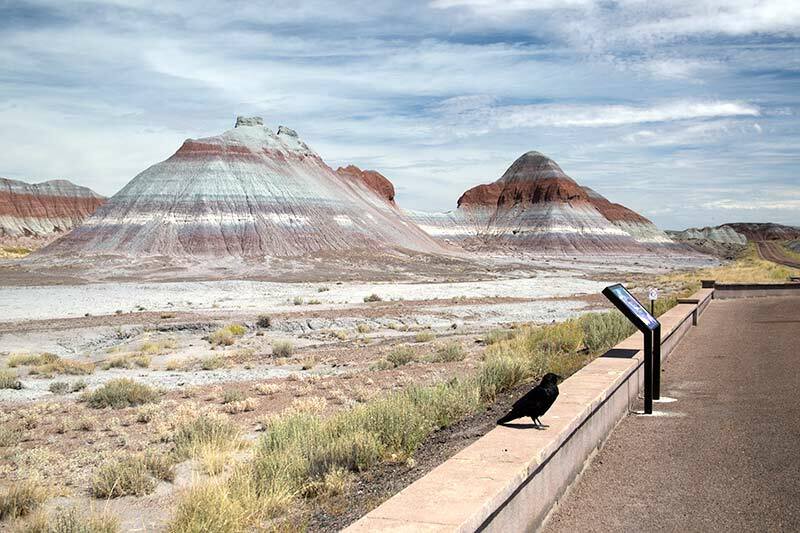 In reality, the Petrified Forest has many features of the Painted Desert that are more interesting than those in the Painted Desert itself..! Such as this feature seen here. Or further along, this one here. There were some petrified log fragments here, you just couldn't see them in this photo. Some of the features look like a Moonscape..! Some even more so. 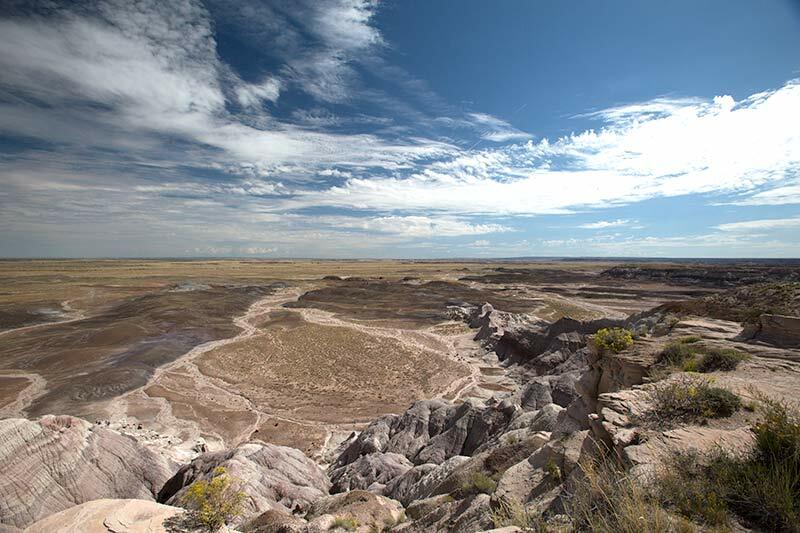 This area, Blue Mesa, has a hiking trail down into this canyon that winds through the peaks. The last time I was here, I took the trail. This time it was closed for maintenance. Amazing landscape. There's always one raven at each of the "overlooks". This one had a threshhold of about 12' when I was on foot, and about 4' when I was in the car - then it would hop over the wall and hide. I suppose some of the idiots that visit feed these things and that keeps them here. Don't try to feed them. They are big and their bite can take off a small finger. Oh yeah. The background - the park calls them Tee Pees. Whatever. Interesting features and colors. 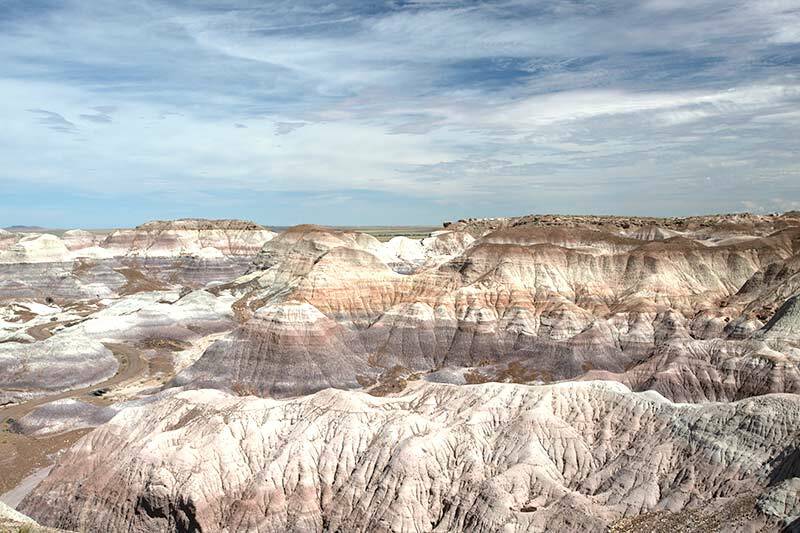 The colors come from the minerals in the deposits. Erosion wears away the softer material leaving the features. This is what they call the Crystal Bridge. It's a petrified log that spans a small gully. The Govt has shored it up with concrete because so many visitors totally ignore the sign that says, "Do Not Step on Bridge." 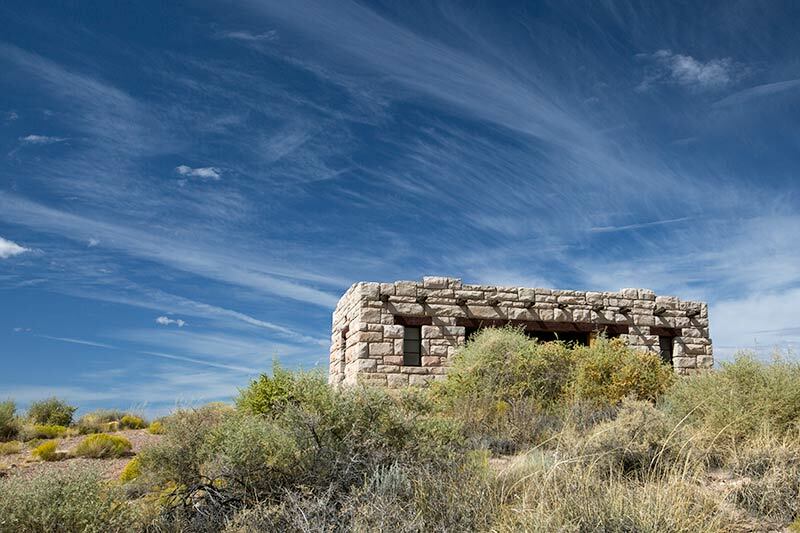 Here's what appears to be an ancient adobe hut. Perhaps left here by the indians who once occupied this area. But that would be the wrong assumption. It's actually a rest area (toilets) under construction. What it is depends on your viewpoint. 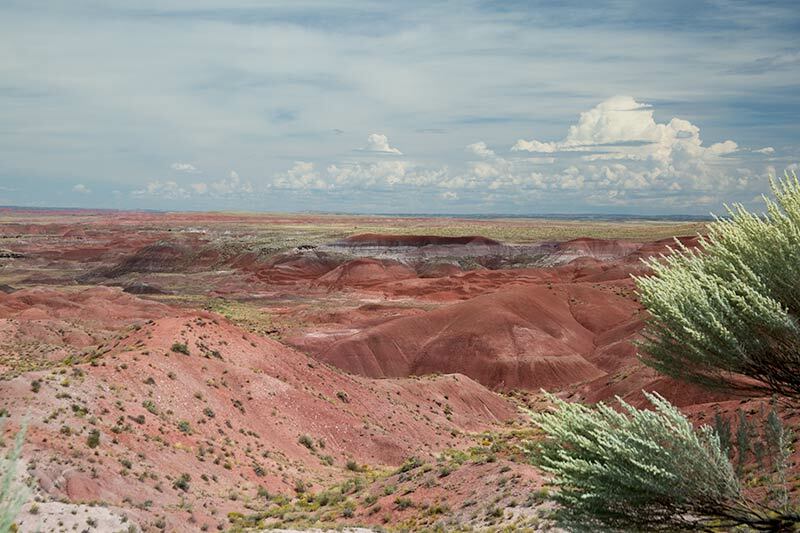 The Painted Desert. 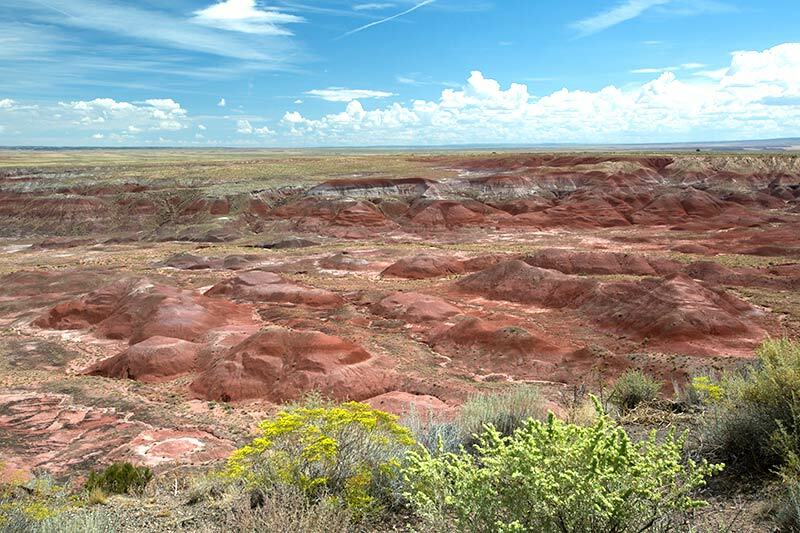 The "Painted Desert" is actually a rather small area compared to the Petrified Forest. At least the area that the Government allows us visitors to look at. Same area from another vantage point. 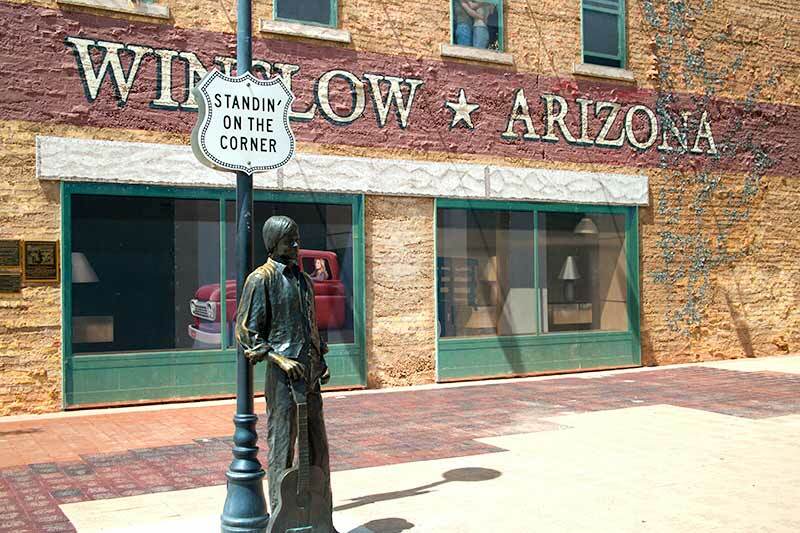 From here, we're about a mile from I40 - which I make my way to and head west to Winslow AZ. Standin' On The Corner Park in Winslow AZ at the corner of Route 66 and North Kinsley. The fame comes from the lyrics of a 1972 song from the Eagles called "Take it Easy". Winslow has little else to see and do. This corner is it. Check out the flatbed Ford in the window. There used to be a real one parked near the corner but not today for some reason. Oil change maybe? Also check the upstairs window. So back on the road and home. That's all folks..!